Figure 1. Powder production output in the Republic of Belarus from different plants in 2007. Figure 2. Issue output for different types of powder production in the Republic of Belarus. Figure 3. Tractor frictional disk with two-sided soldered frictional layer after tests on compound strength. Figure 4. Experimental samples of cone ring parts for the synchroniser assemblies of tractor gearboxes. Figure 5. 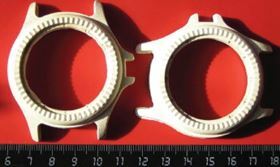 Experimental sample parts of a car braking system made by ceramic injection moulding of alumina-based ceramics. Figure 5a. Experimental samples of watch bodies obtained by CIM from zirconium ceramics. 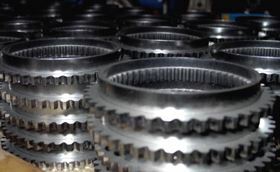 In a country which is around 40 per cent forested and in which agriculture and forestry are major industries, it comes as no particular surprise that much of the powder metallurgy industry of Belarus is devoted to the manufacture of parts for heavy machinery, agricultural and otherwise, that can either be deployed within the country or sold as exports. Professor Alex Ilyushenko of the Powder Metallurgy Institute in the National Academy of Sciences says that there are 16 specialised companies and associations engaged in powder metallurgy in modern Belarus. The industry is modernising. Technology for hot pressing of plasticised powder mixtures was adopted in 2007–2008 and modern technology for high-temperature sintering and hardening of parts from powder steels is in use. Sintering is developing a high-tech aspect in Belarus with the introduction of selective laser sintering of metal powders. In manufacturing, pilot and industrial batches of PM “block rings” for the Belarus tractor gearbox have been delivered. Production technology has been optimised to minimise post-manufacture finishing and the first batch of integrated cone ring parts has been delivered. An industrial batch of parts for hand tools has also been delivered. Physical vapour deposition methodology in the copper-plating industry is planned for introduction in the near future, replacing galvanic methods currently in use. Spreading the arc of powder technology, Belarus is developing ceramicinjection moulding and has already seen some success. Pilot samples of parts of alumina-based pneumodrive distributor system for lorry brakes have been delivered and zirconia-based watch bodies have been made by ceramic injection moulding. Professor Ilyuschenko: “A number of technological processes protected by patents of Republic of Belarus and other countries have been developed and adopted under industrial conditions by Powder Metallurgy Institute specialists together with Production Republican Unitary Republican Production Enterprise of the Molodecheno Powder Metallurgy Plant to make parts from metal powders. Cold stamping of sintered parts made from black and coloured metal powders, the peculiarity of which are great plastic changes in sintered material form accompanied by its intensive packing and strengthening. The technology for solder – sintering of freely sprinkled frictional layers on steel base without galvanic copper coating introduced what is essentially a simplified technology for making frictional disks (Figure 3). As in the case of traditional soldering process, the connected surfaces are processed with a liquid solution of active flux to remove oxides from the base layer surface as well as for protection of connected surfaces from interaction with the environment, for reduced surface tension and increased spreading of liquid soldering agents. The composition developed - “active water flux” – is a mixture of zinc chloride, ammonia chloride and copper chloride salts. Its interaction with iron leads to the formation of easily melted iron chloride. An active reducer for surface oxides is the nitrogen and hydrogen sintering furnace atmosphere. The strength of items such as frictional disks for tractors, made by Belarus-developed technology, are certified by bending tests, as shown in Figure 3. As seen, the strength of the bimetal compound is high, a 180° bend does not result in separation of soldered metal ceramicsand the steel base stripping. That is the main requirement for operational quality control of compound strength. Pilot data have shown that the strength of soldered compound-steel 65G frictional material MK-5 constitutes 5.41–5.6MPa which is by 10% better than the compound strength obtained by traditional method of applying freely sprinkled layer on coppered base. The replacement of the intermediate galvanic copper sub-layer by PM copper increased intermediate strength by 10–15%. This combination has proved to be cheaper and ecologically better since the galvanic copper plating process has come to an end. In a further development hard flux has been introduced into the frictional material, providing a further ecological boost and cost reduction. The method for producing heavily loaded sliding bearings with the use of infiltration of steel sintered bodies by antifriction bronze melts is very promising. Such bearings are used in pivots of the front suspension bracket of dump trucks and lorries. Similar technology is also used in making bimetal bodies of blocks of axial and piston pumps and motors in which working surfaces are coated with anti-frictional powder layers. 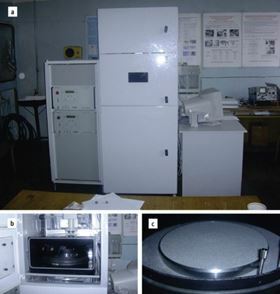 To carry out calculations and completion of technological processes for obtaining PM construction by hot pressing, the properties of diffused and alloyed powders of the following compositions: Distaloy AE + 0,6% C, used for making block rings of synchronisers for “Belarus” gearboxes and Distaloy DC + 0,3%C for making cone rings for synchronisers werere studied. Densmix powder on the basis of Distaloy AE + 0.6% graphite and 0.6% plasticiser DN 120 has the following chemical composition: iron – base; molybdenum – 0.5%; nickel – 4%, copper – 15%, graphite −0.3%. On the basis of literature data analysis and experimental investigation performance, the following main properties of materials under study were defined: fluidity of powders, sprinkled density, density- temperature and pressing pressure relationship curve, elastic after action, Poisson coefficient, Young's modulus and fluidity limit. Taking into consideration the data obtained, we calculated the optimal cycle for heat pressing stepped parts such as a ring with clamp and experiments on technology completion for obtaining block rings for a synchroniser of a “Belarus” tractor gearbox were carried out. Total density of block ring pressing pressed from Distaloy AE powder by heat pressing method was 7.2 – 7.25g/ cm3. Shrinkage after sintering was 0.5%. It has been established that the blocking ring tooth after sintering has the greatest density in comparison with other elements. At the same time, tooth density at the top, at 7.31g/cm3, is lower than the density at the base, 7.37g/cm3. The ring hub also has irregular density distribution. The influence of heat pressing, temperature and sintering time on material structure, properties and sizes of cone rings made from powder Distaloy AE with additive 0.6%C has been studied. (Figure 4) If the synchroniser block rings are produced by thermal pressing methods by a number of companies, the attempt to get a constantly loaded cone ring by this technology and in accordance with our data is a first. It has been established that sizes of pressing obtained by heat pressing increase by 0.1 – 0.2%. After sintering at 1170°C in a nitrogen and hydrogen atmosphere they 0.4% – 0.5%. 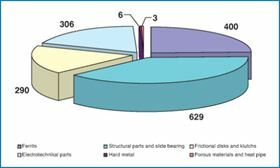 Parts sintered at 11700C for an hour have higher mechanical properties and satisfactory hardness (170 HB) for subsequent final plastic deformation. Annealing at 750 °C for two hours and slow cooling leads to reduced hardness of ring up to 140–160 HB. Calibration for obtaining required sizes must be made after pressure annealing to 650 MPa. The problem for obtaining products of complex form, exact sizes and high density can be solved with the use of modern technology and equipment for injection forming of powder materials. The Powder Metallurgy Institute has acquired an installation for metal and ceramicinjection moulding (MIM/CIM) for investigating processes of injection forming of complex form products of plasticised mixtures of metal or ceramicpowders with part volumes up to 100 cm3, and maximum casting pressure up to 100 MPA. Additionally researchers are looking at other parameters such as granule bin heating up to temperatures of 150 – 200°C; cast form locking effort of 250 – 310 MPA; productivity up to 20 cycles per hour (not less than 3 kg per hour). The first samples of parts – golden couple of pneumodrive system of car brakes (Figure 5) and watch body (Figure 5a) were obtained from plasticized ceramicmixtures Catamould. Multipurpose installation of powder laser stereolithography (selective laser sintering) has been developed and made by Powder Metallurgy Institute. It has a set of unique technology possibilities and great investigative potential (Figure 6). The installation is designed for obtaining solid products of complex form made from metal and polymer powders. The system produces high precision components and the Institute has not spared expenditure on preparation or marketing of finished products. The equipment installed can operate as a laser sintering device or be used for laser melting. In the first case, surface melting of powder particles in layers and their combination by forming liquid metal contact necks is what allows in most cases porous the creation of products with given operational properties in preserving structure and phase composition of the initial material. In the second case, full powder melting in layer is used and products are obtained with virtually zero porosity. The installation is designed for sintering a wide range of materials, the melting temperature of which can differ. The total dimensions of soldering products do not exceed 50 × 200 × 200. Powders, preferably spherical, with the size from 20μ to 400μ are used for sintering. Laser radiation is focused and directed perpendicular to the sintered layer plane. The selective laser sintering process occurs on vertically moving technology platform with the help of a linear step drive. The platform is located in working chamber with a protective atmosphere. The delivery of powder portions to the technology platform and formation of powder layers with given thickness is carried out with the help of a scale. Laser ray scanning in the horizontal plane at a given trajectory and sintering area observation with the help of video is made with the help of an optical system installed on two mutually perpendicularly connected linear step drives. Laser radiation is generated by an optic quant generator on the basis of a monocrystalline alumo-yttrium garnet alloyed by trivalent neodymium (YAG:Nd3+), working at a wavelength of 1064 nm (infrared radiation) with impulse repetition frequency up to 50 Hz. The preparation of the virtual model of product, software control for installation work, technology mode designation and their control in a real time regime is carried through by overall computer control. A Ilyuschenkoa, V Savicha and G Syroegkob. 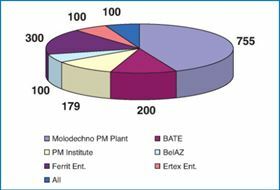 This feature draws on Powder metallurgy of Belarus: science and production, a paper by A Ilyuschenko, V Savich and G Syroegko who are leading researchers in the Belarus industry. It was given at Euro PM 2008 in Mannhiem.